Bigfoot, what's not to love. I'm from the Midwest and believe it or not we still have sightings of the giant beast. In fact we had one about a year ago that for some reason made the news. More so for a laugh, I hope. So even though it was revealed Mr Foot was a giant hoax that doesn't make him any less fun a fictional character. Mad scientists, been around since like forever in films. They always have some scheme and some type of liquid or gas nonsense and are always up to no good. 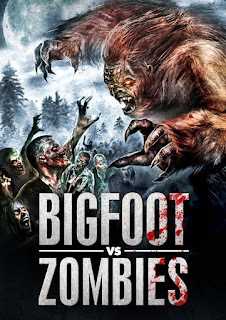 Throw all this together and you have WildEye Pictures New release Bigfoot vs Zombies. Simple story, crazy scientist works on a dead farm disposing of body's. That's gotta be boring. The more you get rid of the more you get paid. So he makes a serum that's toys them faster, unfortunately the side effect is they become,zombies. So we have a group of people are now trapped with hordes of zombies coming after them. Thank God Bigfoot is in the area, because he helps to destroy,these zombies. Plot twists? Nope. Meaningful dialog? Nope. Fun and gory? Yup! If you like monster movies like I do, and you dig zombie films this is a solid film. Funny, bloody, and surprisingly pretty well acted. I would recommend you pick this up. Its pretty good fun.